Phil Cassidy, also referred to as Phil, The One Armed Bandit, is a character in the 3D Universe who appears as a minor character in Grand Theft Auto III, a main character in Grand Theft Auto: Vice City, a minor character in Grand Theft Auto: Liberty City Stories and a main character in Grand Theft Auto: Vice City Stories. Cassidy is a weaponry expert and claims to have served in the US military although these claims are false. He is voiced by Hunter Platin in GTA III and Gary Busey in GTA Vice City and GTA Vice City Stories. His voice actor from GTA Liberty City Stories is not credited. Phil Cassidy was born to unknown parents and grew up with his sisters Mary-Jo and Louise. Phil Cassidy attempted to join the United States military on a number of occasions prior to 1983 but was always rejected due to his drunkenness and temperament. He was, however, eventually allowed to join the catering corps but admits to Jenny Mitchell, when being interviewed for MeTV that he was dishonorably discharged. He continues to claim, however, that he fought in both Vietnam and Nicaragua. Ray Machowski also backs up this story by calling Phil his "army buddy", although this could be from the catering corps. In the mid-1980s, he began to distill his own alcohol called Boomshine, which is highly explosive, which at some point prior to 1986 caused him to go blind in his left eye. In 1984, living in Viceport, Vice City, he had begun a working relationship with Sergeant Jerry Martinez to supply him with weapons from the Fort Baxter Air Base and had his own shooting range. Cassidy is introduced to Victor Vance through Martinez in an attempt to drive away some Cholos gang members who had taken control of Phil's house. Victor continues to work for Phil, who eventually introduces him to his sister Louise, her husband Marty Jay Williams and their newly born infant daughter Mary-Beth. Victor then begins to play a role in Louise's life, beginning to fall in love with Louise and causing her marriage to Marty to break down. Victor also saves Louise from being pimped out by Marty, kills him, and takes Louise and her daughter to live with Mary-Jo. Victor then returns to working with a grateful Phil and helps him from an ambush planned by Martinez, who believed that Phil had betrayed him. Phil then agrees to stay sober, likely realising his drinking had caused the problems with Martinez, and presumably continued to watch over his two sisters and niece. Phil, however, begins drinking again when Louise is killed by Armando Mendez, who (with his brother Diego), had come into conflict with Victor and his brother Lance. Phil then helps Victor to get revenge on the Mendez brothers and, after getting drunk, blows up the entrance to the Fort Baxter Air Base to allow Victor to enter and steal an attack helicopter to launch an assault on the Mendez compound. Victor succeeds in killing the Mendez brothers although this does not stop Phil's heavy drinking. Between 1984 and 1986, Phil decides to shave off his handlebar moustache and closes his shooting range in Viceport, moving instead to Little Havana where he begins living in a trailer inside his new compound. In 1986, Tommy Vercetti arrives in Vice City charged with buying drugs from Victor and Lance Vance, which takes place outside Phil's old shooting range. The deal is ambushed by men working for Ricardo Diaz, and Vercetti is forced to begin earning money to repay Don Sonny Forelli. Tommy decides to rob a bank and is told by safe cracker Cam Jones about Phil's expertise with weapons. Phil agrees to join the robbery crew after Tommy proves himself at the Ammu-Nation shooting range and later suggests Hilary King as the getaway driver. The robbery does not go to plan with SWAT teams and the local police killing King. The remaining three manage to escape (although the player does not have to save Cam). Phil later invites Tommy to work for him with Phil having Tommy kill his rival gun dealer, Pedro Garcia. Following that success, Phil asks Tommy to see his Boomshine bomb, which is wired to a remote detonator. Phil attempts to detonate the bomb but the remote fails to work. Phil then approaches the bomb and changes the remotes batteries, which he had left close to the bomb. An inebriated Phil, standing roughly one meter from the bomb, then detonates the bomb. The subsequent explosion causes Phil to lose one of his arms. Tommy then drives Phil to an ex-army surgeon, not wanting to go to the nearby hospital, to be patched up. At some point after 1986, Phil leaves Vice City and moves to Staunton Island, Liberty City. He established the Phil Cassidy's Fully Cocked Gun Shop in Bedford Point and become an associate of Toshiko Kasen, the disgruntled wife of Yakuza leader Kazuki Kasen. Toshiko later hires Leone Family made man Toni Cipriani, working with her to stop the Yakuza, to take a weapons supply to Phil. By 2001, Phil had moved to a new compound in Rockford, which had become available following the closure of the ferry service to Portland. Phil changed the name of his business to Phil's Army Surplus and began to sell military grade weaponry and had purchased a Barracks OL and Rhino, which can be found within the compound. Corrupt police officer Ray Machowski introduces Phil to Claude. Phil then has Claude defend his compound from the Colombian Cartel who were to try to extort weapons from him. After preventing the Cartel gang members from stealing the weapons, Phil tells Claude to take weapons from his compound and to leave the money behind, that if they'd been together in Nicaragua he would not have lost his arm, and to leave to allow him (likely using his connections to Ray Machowski) to deal with the police. Following The Exchange, Phil allows Claude to use his Rhino. The player can play as Phil in GTA Vice City by inputting cheats. 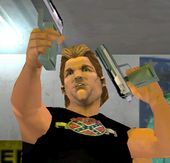 Phil makes the most appearance throughout the series, appearing in four altogether (GTA III, GTA Vice City, GTA Liberty City Stories, GTA Vice City Stories). In GTA Vice City, Phil stats in a phone call following "Gun Runner" that he can only see with one eye because of prolonged intake of Boomshine. In Boomshine Saigon, it clearly shows Phil blowing off his right arm, not his left arm. This is likely simply a mistake in the creation of the cut scene, where they had Phil standing with the bomb to his right, rather than standing on the other side of the bench, with the bomb to his left. Successfully delivering Phil to his friend's place shows Phil correctly, missing his left arm and still having his right. In Grand Theft Auto: Vice City Stories, it was revealed that Phil was beaten by his father for having a sexual attraction to his sister and cousin. He seems to have a sort of dislike towards Mexicans, due to him hating the Cholos and sending Tommy to kill M.A.D. In Rockstar's Manhunt, one of the cops will sometimes say "I promised my little boy I would take him to Cassidy’s Bargain Firearms Emporium tomorrow", suggesting that Phil also has a business in Carcer City. Game art of Phil Cassidy for GTA Vice City. Note that he's holding an AK-47, which doesn't appear in GTA Vice City. Game art of Phil Cassidy for GTA Vice City Stories. This page was last modified on 29 September 2014, at 11:19.